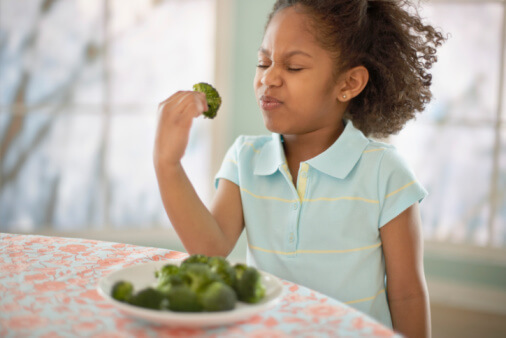 I received a great question from @ChowMamaStacie on Twitter (which was posed by @amanda by way of @kidappeal), “What do you say or do when kids make funny faces as they taste food?” I suggest a low-key, unsurprised, positive response, something along the lines of saying, “Looks like you may not have learned broccoli yet. Let’s try it with ranch dressing and see what happens.” The key parts are the “looks like” (empathy), the “learned yet” (it’s about learning; it’s a process), and the “Let’s try…” (suggesting a positive, reasonable next step). Briefly describing what you think your child is experiencing helps you connect and makes what you say next more believable. Be specific if you can (“seems too mushy” or “too many colors mixed together”). Keep this light, upbeat, and natural. You’re not surprised, exasperated, or emotional about their response. You don’t see what they experience as the end of the story. I didn’t learn to like beets until a few years ago, when pulling some up from Jessie Cool’s garden and cooking with her. I finally love them. Right now, I’m working on cabbage (which is why we have a pot of homemade cabbage soup in the fridge). My kids are learning their own food lessons in their own time. Part of learning a new food is learning a way to prepare it that you like (I now love cauliflower when it’s roasted, not when it’s steamed). One of our responsibilities and privileges as parents is to help foster our children’s Nutritional Intelligence – the ability to recognize and enjoy healthy amounts of good food. What you propose will vary depending on the child and on the circumstance. It might be, “Let’s try the apple with cinnamon,” (combining with a flavor they have already learned to like), or “Let’s try again another day,” (multiple unpressured exposures can help to acquire a new taste), or, “Let’s try cooking it together next time,” (the more a child is involved – cooking, buying, picking from a garden or farmers’ market, or even planting the food, the easier a new flavor is to learn).